I am sorry that you don’t have a piece of this for your holiday breakfast. Truth be told, I am sorry I don’t have a piece of it, myself. It was actually devoured weeks ago. So a little about the role crumb cake has played in my life. 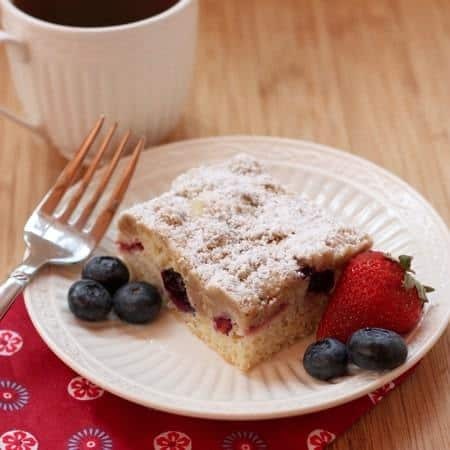 When I was little, I remember my mom always buying the Entenmann’s Crumb Cake for breakfast, usually as a treat on a Saturday or a Sunday. Our other special breakfast was Pillsbury Cinnamon Rolls – oh man, I haven’t had one of those in ages. And they used to have ones with orange frosting. Mmmm, I can smell them now. So while you won’t have this for your July 4th breakfast this year, I still thought it would be fun to share for the Holiday Recipe Club. The Holiday Recipe Club is a blog hop centered around holiday recipes, and trying to inspire people to come up with something different than their usual holiday fare. So each month, participants are given a list of a few ingredients. They must then come up with a holiday recipe that contains at least one of the ingredients. At the bottom of this post, you’ll find links to all of the other participants. For the 4th of July, our ingredients to choose from were Blueberries, BBQ Sauce, and Whipped Cream. 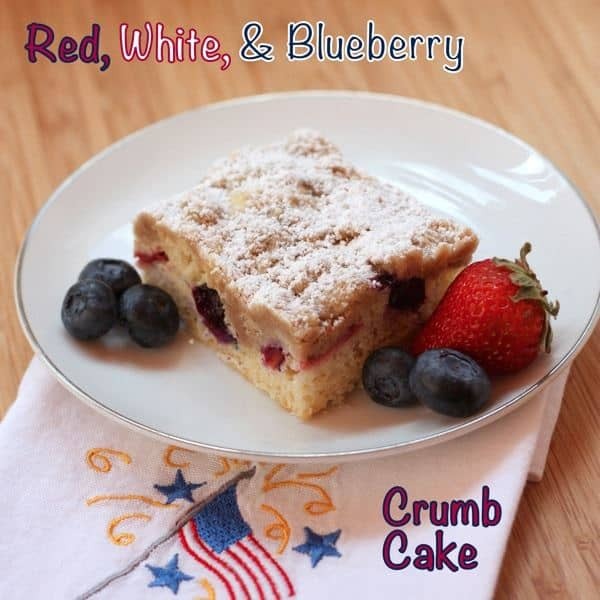 I have been thinking about fancying up the Martha Stewart Crumb Cake recipe for awhile, and this was just the time – blueberries as a required ingredient, patriotic color scheme, and my crumb-cake-loving family all visiting just a couple of weeks before it was time to post. Plus, this isn’t one of those star-spangled red, white & blue desserts that really only seem appropriate on one of the actual patriotic holidays. This is wonderful any day. 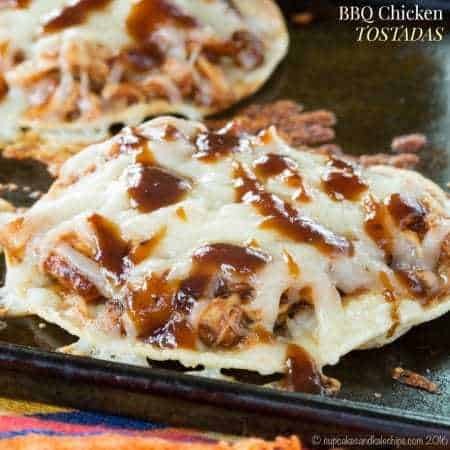 Oh, and I am sure it would not be awful topped with another one of this month’s ingredients – and no, I don’t mean the BBQ sauce. So put that can of cinnamon rolls back in the fridge, and make some of this crumb cake. It may take a little more time, but your kitchen will smell just as good, and the results are well worth it. Your kids, parents, spouse, cousins, friends will love you just as much as I love my mom when I saw the Entenmann’s box or smelled the Pillsbury cinnamon rolls. Maybe more. What did your mom or dad make as a special breakfast when you were a kid? What do you make for your children? In a medium bowl, combine the 2 1/2 c flour, brown sugar, and cinnamon. Pour melted butter over the flour mixture, and toss together until large crumbs form. Combine all of the ingredients in a small bowl and stir until smooth. Toss the blueberries with the flour, and set both the blueberries and sliced strawberries aside. Spray a 9x13 in. pan with cooking spray or line with parchment paper. Set aside. In a medium bowl, sift together 1 1/2 cups flour, granulated sugar, baking powder, and salt. In a separate bowl, whisk together egg, milk, canola oil, and vanilla. 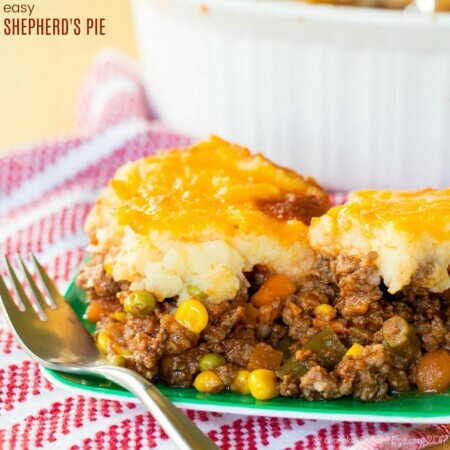 Using a rubber spatula, fold dry ingredients into the wet ingredients. Spread batter into the prepared pan (batter will be thick). Spread the cream cheese mixture over the batter. Distribute the strawberry slices and blueberries over the cream cheese layer. Sprinkle crumb mixture over the berries, leaving some large chunks. Bake for 20-25 minutes, or until set in the middle. Cool completely in the pan, and dust with confectioners' sugar. Cut with a serrated knife. Make sure you check out the other 4th of July recipes with Blueberries, BBQ Sauce, and Whipped from from the Holiday Recipe Club! Aha, that may be it, then. I did use a glass pan. I kept checking every 5 minutes until it wasn’t wobbly anymore, and it took closer to an hour before I was comfortable taking it out of the oven. It did still wobble a bit when I pulled it out, but it’s almost cool now, and I think it’s going to be fine. Thank you for your advice. I’m a new reader, and I’m loving what I’ve read so far. Glad it worked out for you. Yes, the one I made too thick was fine once I baked it longer. Sorry for the discrepancy. I’ll make a note about glass pans. 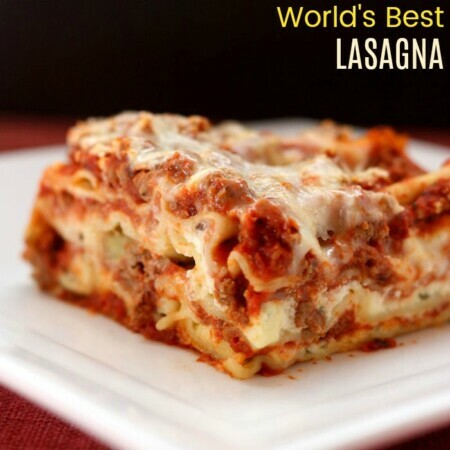 I have this in the oven right now. I’ve followed the directions exactly, as you should the first time trying out a new recipe. My cake has already been in the oven for 35 minutes, and I’m having the problem you described in the body of your post. It’s still wobbly and not setting up.. not even around the edges. What could I have done wrong? It might “wobble” a little depending on how soft your berries are. Honestly without being there with you, it’s hard for me to say. You did use a 9×13 inch pan, correct? I typically use a metal pan. If you used glass, perhaps it needs to bake longer. 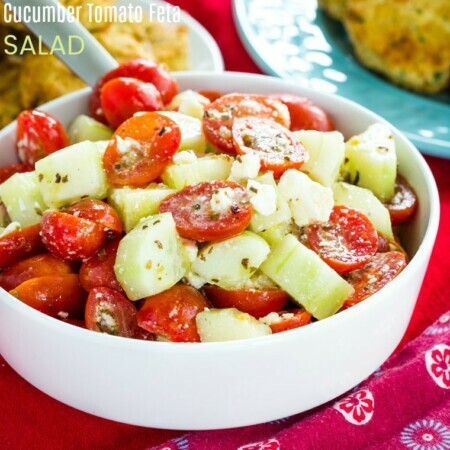 Brianne this looks so yummy sharing on my FB and Twitter today! wow that looks fabulous. 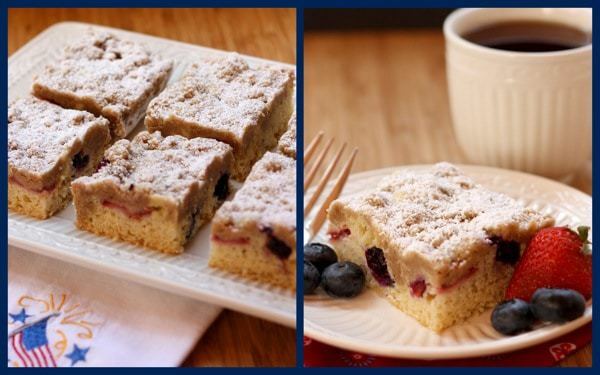 i love crumb cake, but adding the berries is a great idea. btw, love the name of your blog. i feel like that’s my life, the indulgence and the food that’s good for me LOL. 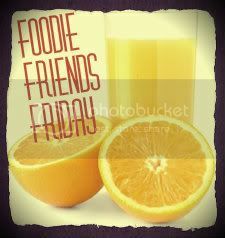 Thank you for your wonderful submissions to FFF! Look Srumptious! Yes, I would grab at all the stray crumbs as well. This looks really good! Thanks for sharing! I LOVE crumb cake! the less cake the better! never had homemade as a child; but hope I can make this successfully. Special breakfasts at our house were dad’s omeletts and mom’s eggs on bread (similar to a french toast). More crumbs is the only way! Give it a try. It isn’t hard. I have a weakness for canned cinnamon rolls too! I am also sorry I didn’t have some of this for breakfast this morning! They really are good! Total guilty pleasure. Oh my that looks insanely delicious! I was just going to search for blueberry recipes to use up the container I have in my fridge – not sure I need to search any further! Oooh, I hope you give it a try. You could probably use all blueberries if you have to use them up and/or don’t have strawberries. Thank you! I wanted to do something that was festive for the 4th, but not too holiday-specific, since it was not getting posted till the 4th. This looks so good! I adore entenmann’s! This looks way better than theirs! 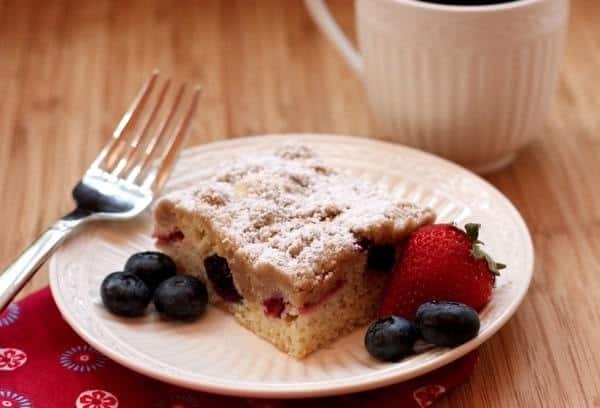 I love crumb cake! 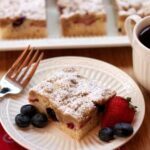 Yours looks really good with the cream cheese layer and the berries. I’ll add this to my crumb cake recipe collection. Thanks! I hope you get a chance to try it. 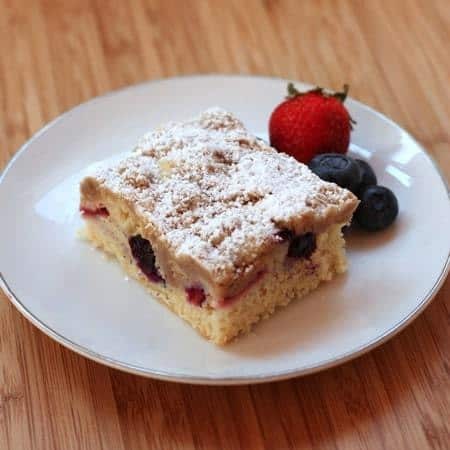 It really was a nice twist on the standard crumb cake. Yummm, crumb cake. 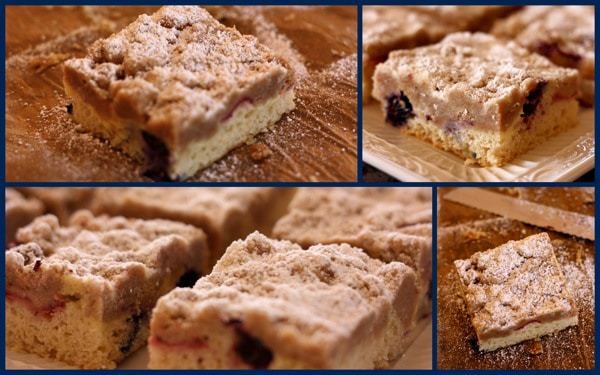 I make a brown sugar crumb cake that I love as well…these sweets..they have power! Happy Fourth of July!